General Mills is recalling two days of production of Cascadian Farm Organic Cinnamon Raisin Granola cereal. The product may contain almonds, an allergen no declared on the label. 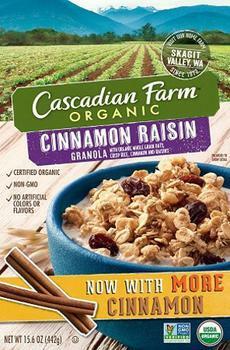 Cascadian Farm Organic Cinnamon Raisin Granola cereal produced on July 15 and 16, 2017 is being recalled because the product may contain almonds, an undeclared nut allergen. Consumers with nut allergies should not consume products bearing the affected code dates and should contact General Mills for a replacement or full refund. Customers who purchased the recalled product and have nut allergies should not consume it. Consumers requesting refunds, replacements or have questions may contact General Mills consumer services at 1-800-624-4123.